Last week I had the privilege of participating at the Kern Reading Association’s Young Author Fair, in Bakersfield, CA. In three words, What a Blast! Not only did I enjoy spending time with other folks who love children’s books (students, fellow authors, reading enthusiasts, librarians, educators) but I had the joy of visiting four fabulous schools—Columbia Elementary, Roosevelt Elementary, Franklin Elementary and Sequoia Elementary. The event culminated with the Young Author’s Fair, where thousands of student-written books were displayed at Standard Elementary School. This truly was a happening event that highlighted many, many outstanding young authors. The things that struck me the most about my week in Bakersfield were the amazing students and their dedicated, hard-working teachers and staff. Children were courteous, enthusiastic and eager to hear my stories and ask questions about writing and being an author. Educators had prepared their students for my visit, thus creating an atmosphere of interest and excitement (one school had been reading my jokes over the loud speaker during the various times of the day—since January!). I saw school staff bending over backwards to insure that books were placed into the hands of children. I was particularly touched to hear about the students of a high-poverty level school who were paying for their books with coins they had scrimped and saved—surprising the school staff and clearly showing that children are thirsty for books and will do what they can when the opportunity presents itself to them. At the KRA Author Dinner on Friday night, each author had to give a brief talk about our week. I shared a statement that night that I’d like to repeat here—people who say that the public school system is failing our children have clearly never been to Bakersfield. And I know this concept is not limited to Bakersfield. Amazing things occur in classrooms throughout the U.S. every day. I only wish other folks could see the magic firsthand. Hi, my name is *** *** and I’m from Sequoia Elementary School. Also I love all your books, especially the joke books. I think you will really like Sequoia because I know I do! Our library is the funnest! We have a school song and cheer. I hope you have a really really great visit. We also are going to have so much fun reading all your fun books. 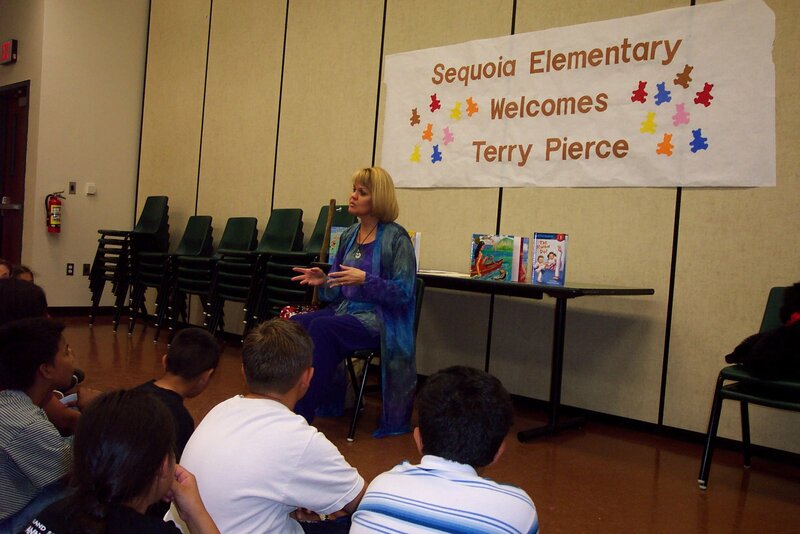 So I really do hope you have a nice visit at Sequoia Elementary School.